Partition the drive into 2 partitions, one NTFS and one FAT32 (seems easier to work with Ghost using a FAT32 drive). Installed Windows XP onto the NTFS partition of the new drive. Create a full Ghost Image of the brand new XP install AND another Image of the original hard drive from DELL with the Vista OS (just in case I ever want to give Vista a try). Wipe Vista off the original hard drive giving me another 320 GB of storage. Well, my plan came to a screeching halt at step 4 when my Version of Ghost (which I’ve been using since 1999) kept freezing at the intro screen. I couldn’t figure out if it was a problem with the SATA drive or something else with the new system… bottom line: Ghost wouldn’t work. What to do, what to do… I had the choice to try a new version of Ghost or a different solution all together. I’ve been speaking with my brother and reading some articles on the new versions of Ghost and I wasn’t too impressed. To the Internet I went and searched for the term “alternatives to ghost” and found a GREAT resource: http://ghost.radified.com/ghost_alternatives.htm. This is where I found the $19 program “Image For Dos” that offered a free trial. Well, I loaded it up and it worked like a charm! I was able to fully backup AND restore my whole hard drive partition data. Used the Batch File Sample for Maintaining a Rotating Backup designed by “Image For Dos” – This runs the backup script automatically and rotates the backups through the letters A, B, C then back to A. I edited the script so that it will go through the whole alphabet before it overwrites A again. So, all I have to do is pop the bootable CD into my computer, reboot, go get some ice cream and by the time I’m back there is a shinny new backup image file waiting for me. Synchronize all the images (and we have a lot) between my computer and my wife’s computer. This allows both of us to edit the pictures and provides a backup of all our important stuff in case one PC / hard drive fails. Upload about five VERY important documents (financial info, passwords, etc.) to a secure server that I can access from any PC. Synchronize all my files, pictures, backups to an external hard drive. This is great because only edited files are changed or added. Well, I’m pretty happy about how simple and clean my new backup process is. If you have any comments or suggestions on the applications or the process I’m using please comment below. I was completely back to where I was before the virus hit in about an hour. The more recent virus was VERY malicious. It popped up a window saying, “Your system is running slow so Windows will attempt to defragment”. A program started up and looked like it was doing a defrag, but I knew it wasn’t legit. I did CTRL+ALT+DEL to kill the program but once I did that a ton of other errors started popping up. I unplugged my network connection and shut down my PC. Next I created an image of the system and rebooted my pc. The “defrag” virus program popped up again and I again tried to kill it. I then attempted to access the “My Documents” folder to backup all my files to do all the steps I have marked above, but the entire folder was empty!!! I was freaking out! I turned off my PC and restored an image from a month ago. I then used the “image explorer” program to view the files in the image I took right after shutting down my PC. YAHOO, all my files were there! The virus must have erased them during the reboot of my machine AFTER I took the image. It took me about three hours to completely get things back to where they were (most of that time was restoring individual files and folders from the image file). I’m so thankful that I’ve got a backup system nailed down and that I have the tech skills to fix this stuff. I can’t imagine how stressed I’d be if I didn’t have both! Super simple to use: It adds a folder to your computer so you just drag drop into it like any other folder and then it syncs with your files online. Revision history: Say I make some changes to an excel file and then sync it with DropBox. 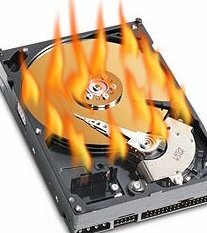 In most backup systems, once you overwrite your backup, you’re hosed. Well, DropBox keeps a revision history of all changes for 90 days! So even if you overwrite your file a bunch of times, each revision will be there for you to restore. Sync only changes: I have some huge files and I was worried that with ever change that DropBox would require the whole file to be uploaded. I was shocked to learn that the system only syncs the changes to the file. This is actually really complex… example: Say you have a huge image file that is 30 mb in size and you edit just one pixel. Usually that tiny change would require the whole 30mb file to be synchronized. With DropBox, only that one little bit of info needs to be uploaded. Night and day difference!